I have to say, the permadeath thing adds a certain je ne sais quoi to Dungeons of Dredmor. Actually, je sais exactly what it adds. It adds terreur. I just made it to level 8. And I’m scared to play more, because level 7 was hard. 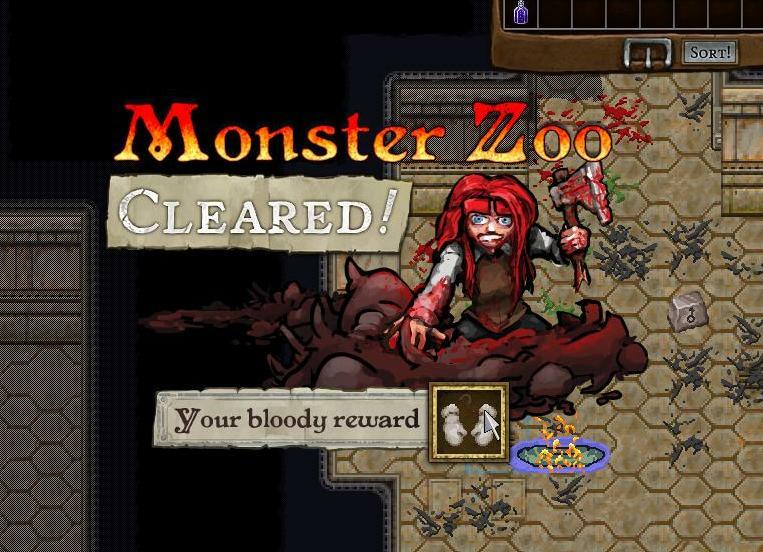 I’m constantly braced for a monster zoo– but in a sense those are easy, because there’s no problem tossing all of your carefully hoarded ranged weapons at it. Level 7, the frozen level, has lots of rooms with half a dozen monsters, which can get hairy, especially as some of them are these burly blue dudes who are fire-resistant and dish out 20 points damage (i.e., five hits and you’re dead). I figured that if I died, I’d be so frustrated I probably wouldn’t want to restart, so I created a backup character. And they’re both pretty vulnerable. Current favorite skill tree: Psionics. There’s a real lifesaver of a skill that shoves monsters back– very useful for keeping an encounter ranged-weapons-only. Plus its pyrotechnics skill is almost as good as the Promethean skill tree (i.e. pyros). I enjoyed Vampirism for awhile– you can get health back by drinking dead monsters’ blood, and there are generally plenty of dead monsters about. But neither of my current characters are vampires, and anyway Psionics has a good health skill too. Permadeath is kind of a cheap mechanic, but it sure induces cautiousness and makes every close shave nerve-wracking. The biggest drawback– while I’m alive– is that I’m afraid to just explore things. I didn’t know till I checked out the wiki that you can eat mushrooms. All this intensity reminds me of a game I’m not playing: Day Z, the zombie mod for Arma II. It’s an open-world infested by zombies, who are tough but not as much of a threat as the other players, who will happily shoot and loot you. And if that weren’t enough, you have to get food and clean water (and bandages, if you’re bleeding), or you’ll die. And it has permadeath too. What’s striking about it is the effect it has on people: it gives them a drive to tell stories. You can see it in this RPS article, and I see it in my Mefightclub freinds who’ve played it. They want to tell how they survived the first day and how they got through the first zombie attack and how they decided to kill, or not kill, another survivor, and how they died, as they inevitably do. It may just be post-traumatic stress disorder, but if you’re looking for the thing that distinguishes video games from movies and books, that’s it. The frequent complaints that games don’t tell good enough stories are missing the point. The best games don’t narrate a story at you. They provide an environment, and the game and you create an experience together.